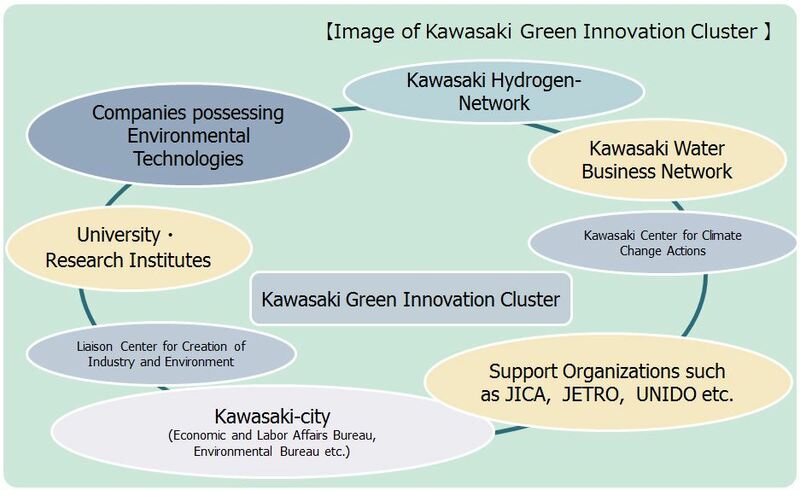 Kawasaki Green Innovation Cluster is a network established in April 2015 for promoting the four mainstays of the “Promotion Policy on Kawasaki Green Innovation”. It aims to improve the environment through industry-university public-private partnerships and promote industries and international contribution so as to form a new society. The Cluster office provides one-stop consultation about how to access various measures provided by divisions of Kawasaki City and supporting organizations. We support the creation of new businesses by effectively collecting, providing and sharing various information on Clusters. 3. Support for creation of businesses taking advantage of environmental technologies, administrative knowledge and expertise accumulated in Kawasaki City. We proactively support business development to create new businesses in partnership with Kawasaki City. Support for packaging and globally promoting environmental technologies, products, services, administrative knowledge and expertise accumulated in and around Kawasaki City.